Cloudburst Research’s AutoStitch Panorama has earned praise for giving even novice photographers the ability to stitch together panoramic photos on their iPhone. The newly released 3.0 update to the mobile app promises to make the process even easier while letting even more mobile users get in on the action. AutoStitch allows you to combine any arrangement of photos into a high resolution panorama of up to 20 megapixels in size. All you need to do is snap several pictures of your subject, making sure that they overlap to an extent, and throw them into AutoStitch. With the touch of a button, AutoStitch arranges and blends your photos to form a nearly seamless panorama. Previously available just to iPhone users, the update adds compatibility with the iPod touch (and the iPad as well, though not as a native app). Autostitch Panorama 3.0 introduces new features as well, adding advanced image compositing techniques that have normally been reserved for desktop computers. These powerful blending and exposure algorithms aim to remove brightness differences while preserving the sharpness of the original images. This results in seamless panoramas comparable to those made with desktop editing software. Also added to AutoStitch is the ability to share your panoramas through Facebook or e-mail, as well as a new in-app video tutorial to help you get started. 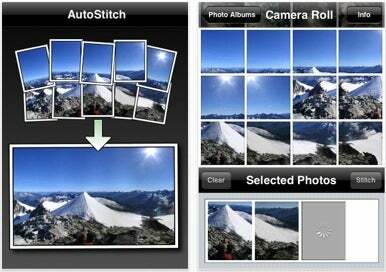 AutoStitch 3.0 costs $3 and requires iOS 3.0.